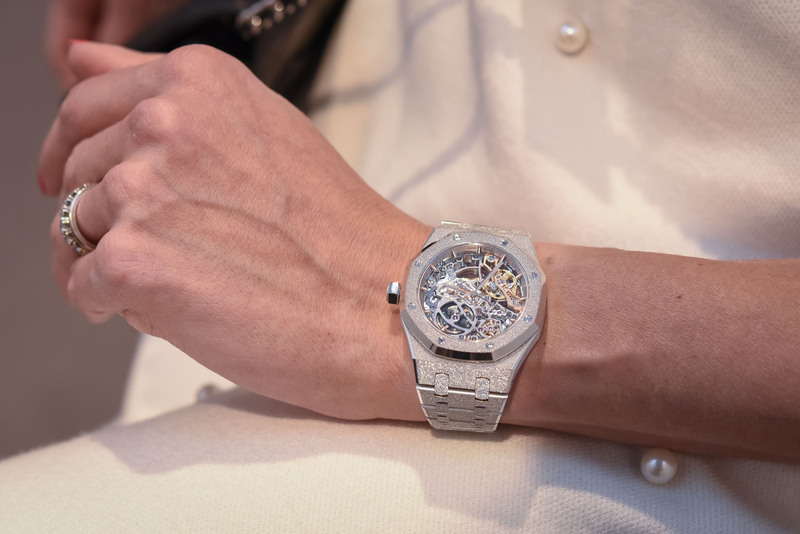 At this year’s SIHH, Audemars Piguet launched the new Code 11.59 series, which has caused a fierce response among watch fans all over the world. 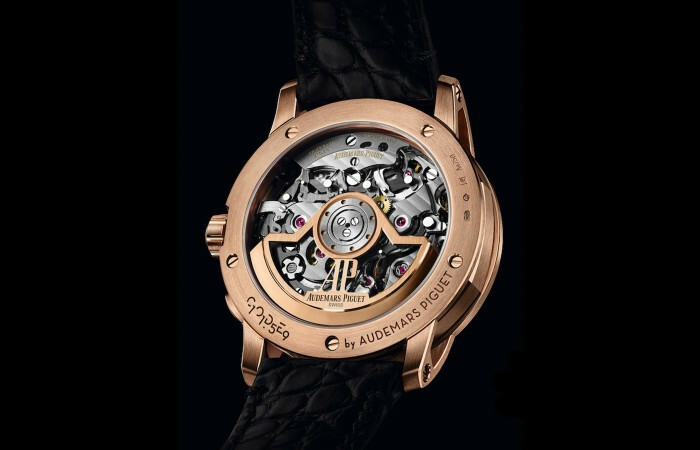 It is worth noting that while introducing the new Code 11.59 collection of Audemars Piguet, Audemars Piguet also launched a series of new self-produced movements, including automatic Centre Seconds 4302 movement (4300 series), automatic chronograph movement 4401(4400) Series), replacing the 3120 series calibre used before Audemars Piguet on Code 11.59 and Royal Oak (15500). Among them, the 4401 chronograph movement is the first self-produced automatic chronograph movement of Audemars Piguet. 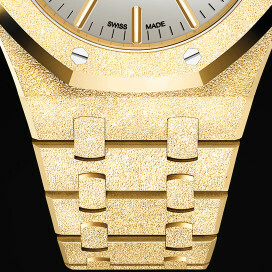 The Audemars Piguet movement has been fully upgraded. 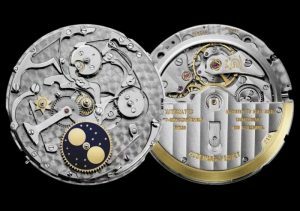 Let’s take a look at the Audemars Piguet 4401 chronograph movement, so what kind of movement is it? The new 4401 movement is the first self-produced integrated chronograph movement of Audemars Piguet. We know that Audemars Piguet, Patek Philippe and Vacheron Constantin are Swiss traditional watchmaking troikas. 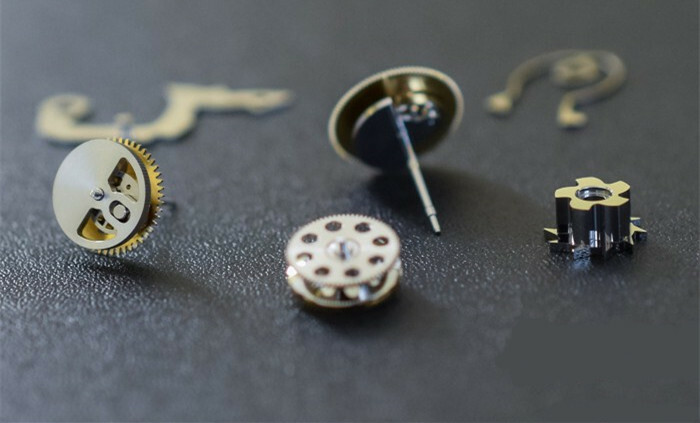 In the long period of time, the three major brands used high-quality purchased movements, and the movements mainly came from Jaeger-LeCoultre, Blancpain, etc. (at that time, the self-produced movement was not popular). Among the chronograph movements, Audemars Piguet used the Jaeger-LeCoultre movement and the Blancpain 1185 chronograph movement. 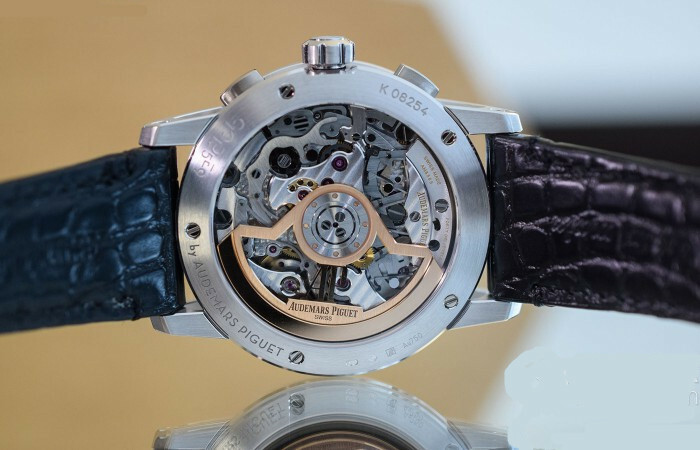 After Audemars Piguet launched its own 3120 movement, it added the Dubois-Depraz timing module (3126/3840 chronograph movement) to the 3120 movement for use on offshore chronographs. 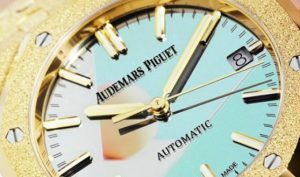 The Audemars Piguet 3126/3840 chronograph movement used on the Audemars Piguet Offshore chronograph. This movement adds a timing module to the 3120 movement, so the timing structure of the movement is not visible. 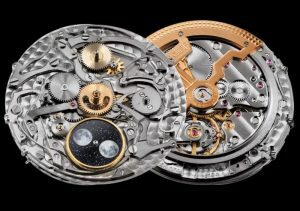 One might say that since Audemars Piguet already has a 3120 calibre with a chronograph module (3126/3840 chronograph movement), why is there a new chronograph movement? 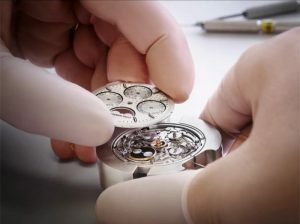 This is because, compared to the movement with the chronograph module, the special integrated chronograph movement is more powerful and can exhibit more technical features (modular movement, because the chronograph module is mounted on the front of the movement, so you can not see the timing structure from the backing). 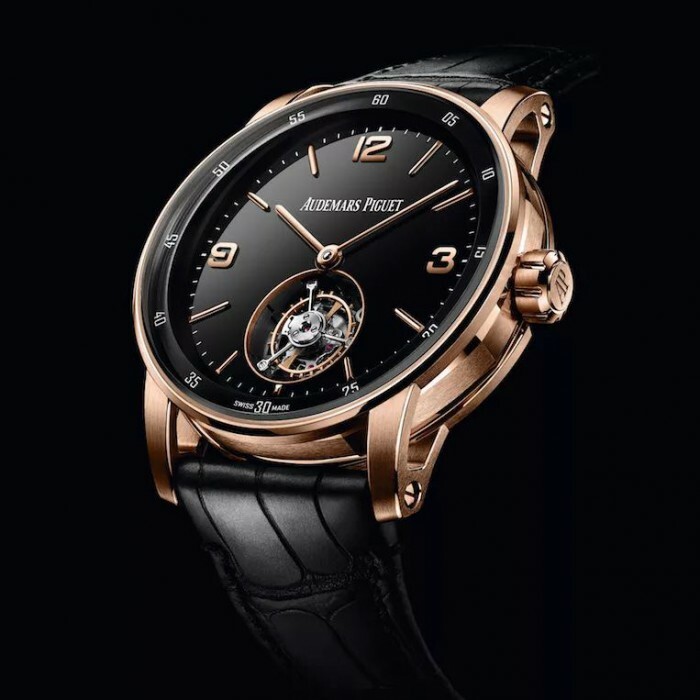 According to Audemars Piguet, the new 4401 movement (4400 series) has been developed since 2013. The focus of the new 4401 movement is to highlight performance. Audemars Piguet’s new chronograph movement 4401 is an integrated chronograph movement, we can see a variety of timing structures such as cylindrical wheel, zero return lever and etc. 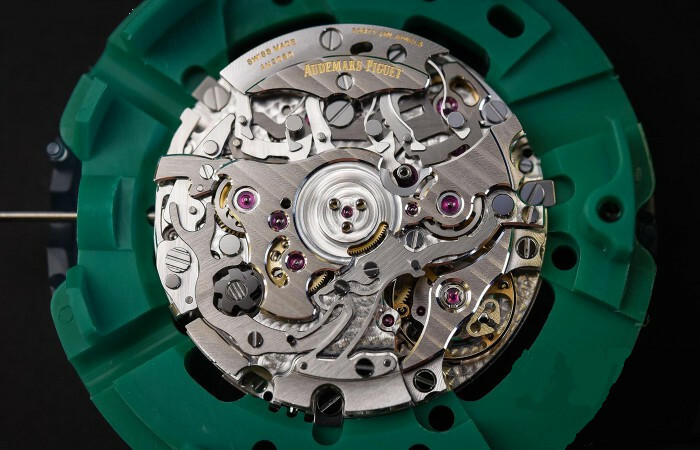 In the end, Audemars Piguet developed two new movements. One is the 4300 series (4302) Central Seconds automatic movement, and the other is the 4400 series (4401) automatic chronograph movement. 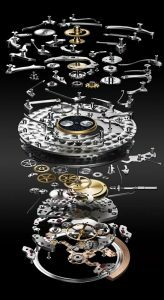 The two movements have the same size with 32 mm, while sharing the spring, balance, escapement, gears, splints and other parts, is Audemars Piguet’s new generation of self-produced movement. Let’s take a look at the technical configuration of the 4401 movement. Audemars Piguet’s new 4401 chronograph movement measures 32 mm in size and 6.8 mm in thickness, and the movement is larger than the Audemars Piguet modular 3126/3840 chronograph movement (29.92 mm). The new 4401 movement has a frequency of 28,800 times/hour, more than 2,1600 times/hour of the 3126/3840 movement. The higher the swing frequency, the stronger the ability of the movement to resist external disturbances. The 4401 calibre uses a traversing balance splint, without card-level weights to fine-tune the balance, the balance has 3 spokes, and 6 fine-tuning weights. The 4401 movement is powered for 72 hours, bi-directional winding, and a 50-hour moving reserve over the 3126/3840 movement. The core configuration of the 4401 chronograph movement is a cylindrical wheel, vertical clutch, and a flyback function. 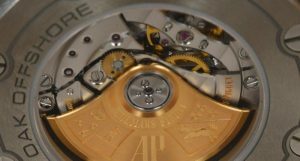 Audemars Piguet’s new 4401 chronograph movement, we can see a variety of technical details. Columnar wheels and vertical clutches are standard on modern high-end chronographs, in addition to make the chronograph has a very good handling feel, the petal-like shape is very beautiful. At the same time, the columnar wheel has two layers above and below. When the chronograph is operated, the operation of the column wheel can be seen. Before the Audemars Piguet 3126/3840 was a modular movement, the timing module was on the front of the movement, so these technical details were not visible. This time on the new 4401 movement, you can see it directly. Removing the auto-turbine 4401 chronograph movement, we can see more construction. The 4401 movement uses a vertical clutch. The vertical clutch controls the chronograph start and stop by combining/disengaging the chronograph second wheel and the travel time second wheel through the friction plate. The advantage is that the vertical clutch uses the friction plate without the direct engagement of the gear. When the timing is started, the chronograph second hand will not shake. The traditional horizontal clutch and the oscillating gear clutch are the combination/separation between the gear, and the “collision” between the gear teeth will cause the chronograph second hand to slightly jump before and after the timing starts. 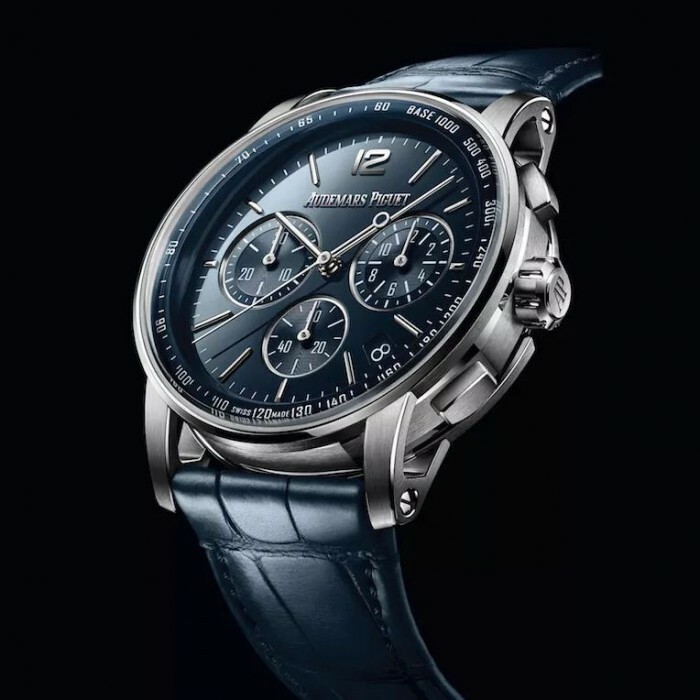 In fact, the slight change has no effect on the use, but the luxury watch needs to be refined, so the new chronograph movements are adopted with vertical clutch. 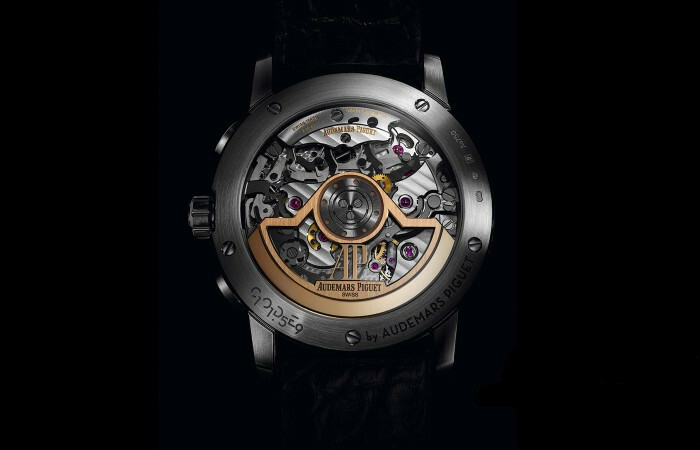 Audemars Piguet 4401 movement has a flyback function, which is to press the zero button of 4 o’clock in the timing process. The chronograph can be directly reset to zero and restarted immediately, needn’t to stop according to the conventional chronograph (by 2 o’clock button), return to zero (press the 4 o’clock button), start (press the 2 o’clock button again), press 3 times, the flyback function is enough to press once. As far as we know, Audemars Piguet new 4401 calibre has three independent zeroing faders, one for the chronograph second hand, one for the chronograph minute hand and one for the chronograph hour hand. In this part, some chronograph movements, in order to save some cost, use an integral part (3 slots on one part) instead of 3 independent zero-push putters, although the functional effects are the same, in other words, high-end watches are focus on fine work and excellence. The more complex and detailed the structure, the higher the value. These technical details are the distinction between top brands and general brands. 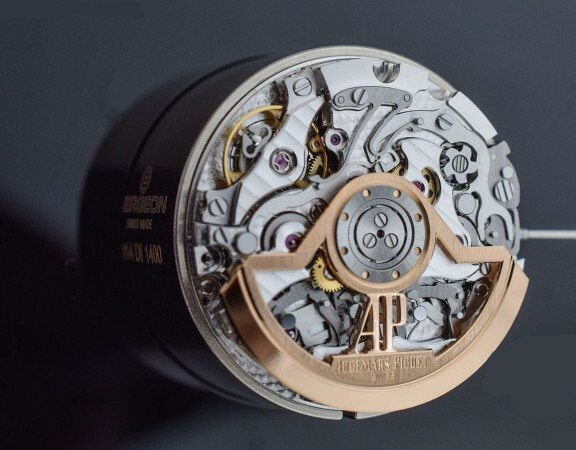 The core components of the Audemars Piguet 4401 chronograph movement including vertical clutch, cylindrical wheel, zero return putter and so on. 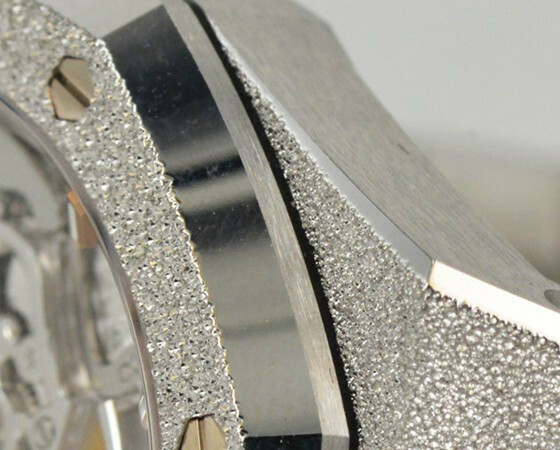 In the movement polishing decoration, Audemars Piguet 4401 movement, the upper splint is polished Geneva stripe, the lower layer is fish-scale patterns. The places where the movement can be seen or not can bee seen are polished. 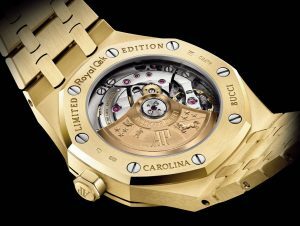 The movement uses a 22K gold automatic turret. 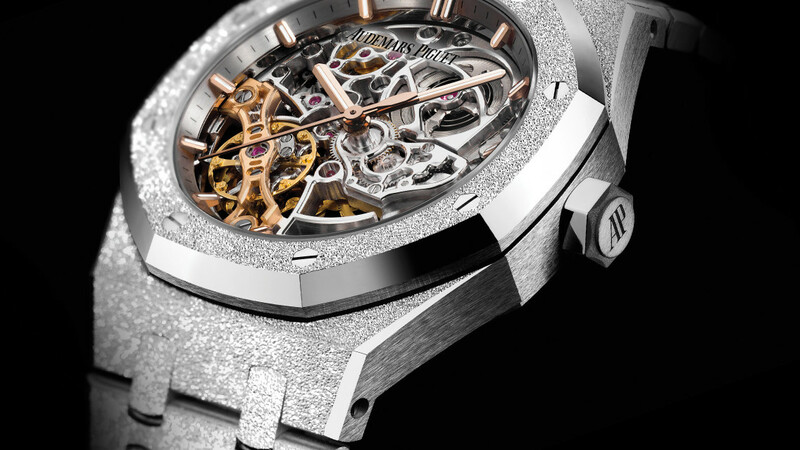 The automatic gyro has a large area skeleton design, and there is an AP logo in the middle. The complicated parts of the structure can be seen through the skeleton, full of very strong ornamental value. Audemars Piguet’s new Code 11.59 collection watch is eye-catching. 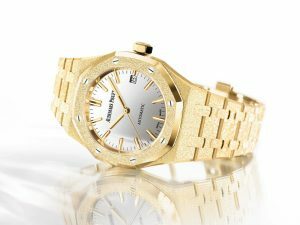 Audemars Piguet’s new Code 11.59 series watches are all attractive, and aesthetic issues are not expressed here. 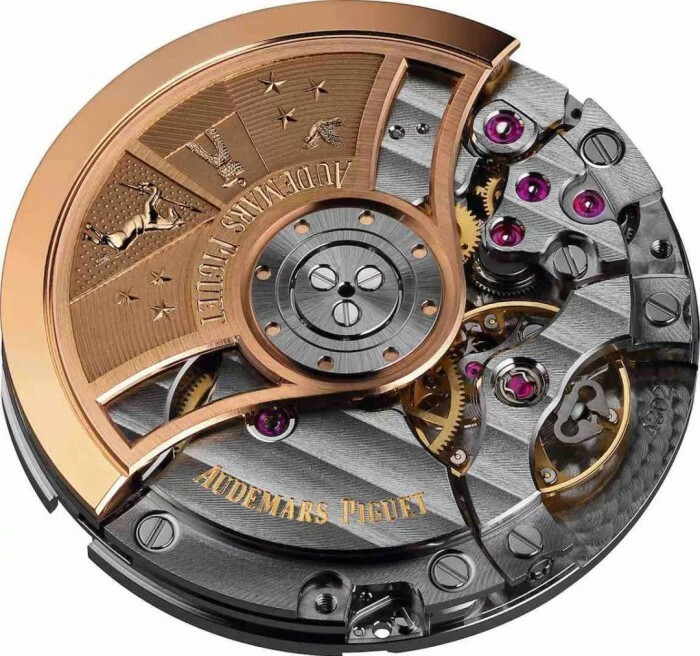 However, in terms of Audemars Piguet’s new 4401 calibre, the technical level and viewing level of this movement are in line with Audemars Piguet’s troika. 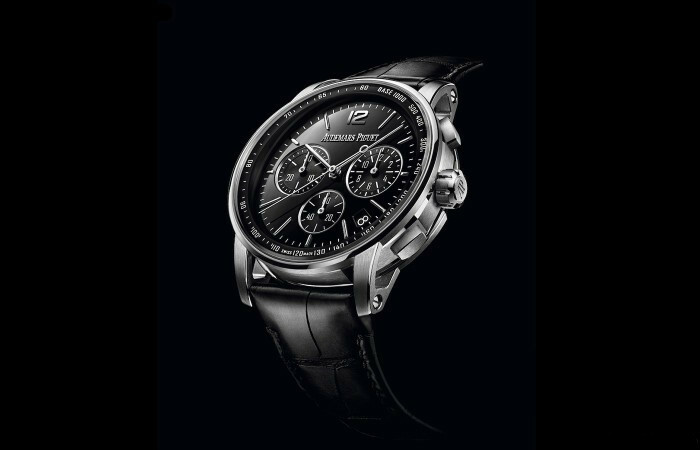 In the automatic winding chronograph movement of the major luxury watches, it is absolutely in the lead. 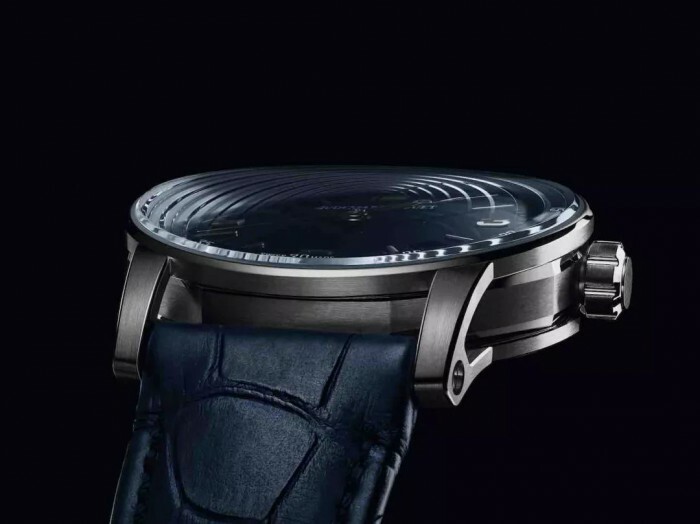 The first watch event in 2019, “Salon International de la Haute Horlogerie Genève SIHH”, has come to an end. I have watched and played hundreds of new products, returned home, arranged my notes, and provided you with my observations and recommendations. 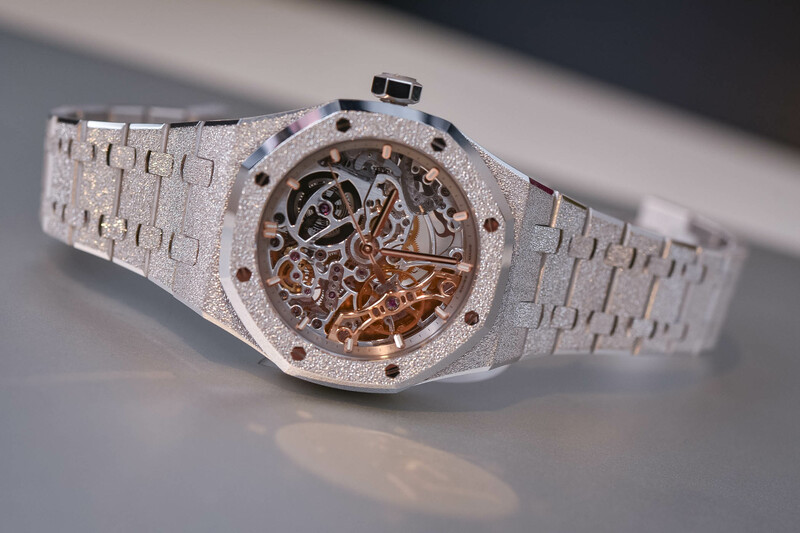 What impressed me most is the Audemars Piguet Debuts New Code 11.59 Collection, that means all zeros and begin anew. Let’s take a review together. 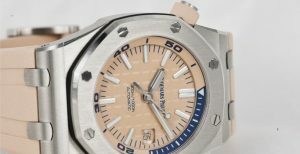 When it comes to Audemars Piguet, the first thing that everyone thinks of is the Royal Oak and the Royal Oak Offshore. These two series are masculine and domineering, and they are sought after by many people. Some of these models are hard to find, not only have to wait for a long queue, but sometimes get at increased prices. However, Audemars Piguet’s other series are indifferent. 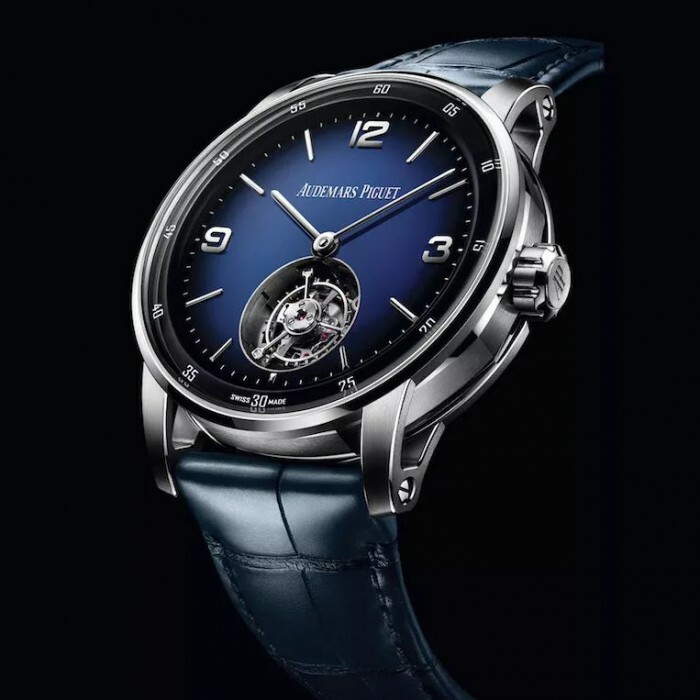 For example, the men’s watch of the Millenary series has been discontinued. Recently, the Jules Audemars series has also been discontinued. Why? I think everyone should guess. 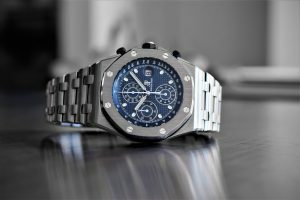 Although the Royal Oak and Royal Oak Offshore Series make the brand earn a lot of money, the record was exceeded 1.1 billion Swiss francs in 2018 for the first time, it could not be hanged on a tree, so it is imperative and urgent to create the next explosion, especially the iconic round watch. This year, Audemars Piguet launched the new Code 11.59 series and left 90% of the release time to the new series. At 11:59 in the middle of the night, it symbolizes the opening of a new day, with unlimited hopes and possibilities, and it represents the brand’s intentions – everything goes back to zero and starts again. 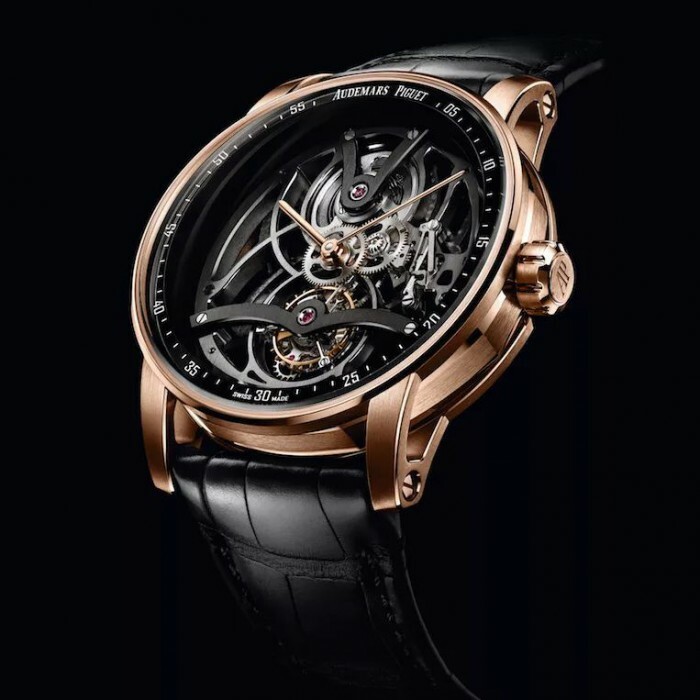 This series has launched 13 models in one breath, with 6 movements, 3 of which are still new movements, from the most popular Central Seconds watch with date display to flyback chronograph, to perpetual calendar, flying tourbillon, skeleton tourbillon and minute repeater, it is awesome. The Code 11.59 collection is highly recognizable and easily stands out from the many rounded watches on the market. The inner surface of the sapphire crystal is round and convex, and then the outer surface of the crystal is symmetrically curved with a slightly inwardly concave shape, just like the appearance of the Beijing Bird’s Nest. If the dial is flat, looking from 6 o’clock to 12 o’clock, you will see a circle of concentric arcs on the mirror, the visual effect is very wonderful. The structure of the lugs is also very unique. From one side, it is to embed an octagonal case in a circular frame (this seems to be in line with the installation of the octagonal bezel on the round case of the Royal Oak). It’s a bit like the smell of a flying saucer. Finally, the Logo is made by a chemical plating deposition process similar to 3D printing. The solid gold layer is accumulated and has a three-dimensional effect. 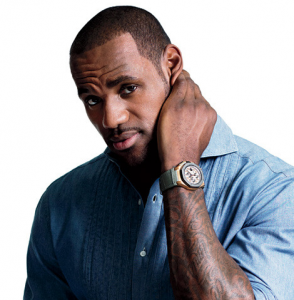 The watches are all 41 mm in diameter and can be worn by both men and women. The 41mm sounds not small, but perhaps because of the concave mirror, it doesn’t look big after wearing it. 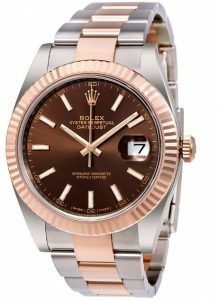 To say that this series has some shortcomings, it is only the rose gold and platinum version, there is no stainless steel. 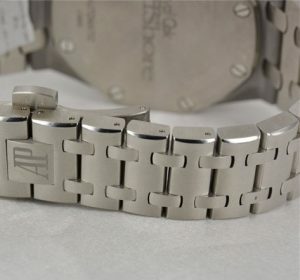 At present, the entry price of the central second date watch is approaching 26,800 USD, compared with the Royal Oak of the same material, the price is quite cost-effective, and the movement is upgraded. The new 4302 movement has 70 hours of power reserve. 2019 new version. 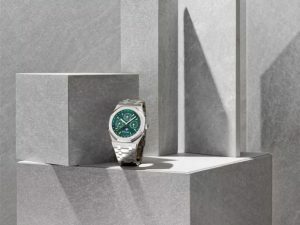 The 2019 Royal Oak version also began to change the movement. 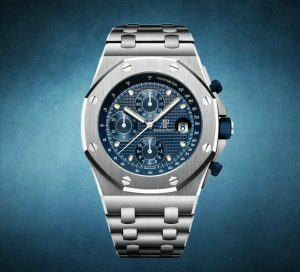 The birth of the Audemars Piguet Royal Oak Offshore Watch was a difficult process: in 1989, famous designer Emmanuel Gueit was commissioned by Audemars Piguet to create larger sizes and combine various materials to showcase unique sports designs and extreme craftsmanship. At this time, the design features of the Royal Oak series were widely recognized, and Emmanuel Gueit decisively chose a larger case size than the Royal Oak series – 42 mm, and you can see the appearance between the bezel and the case. The large-size rubber waterproof gasket has excellent water resistance: this watch represents the highest waterproof sealing performance of all chronographs at 100 meters. My rose gold-plated Swiss Audemars Piguet Royal Oak Offshore chronograph replica watch is only suitable for daily use, but it is both of elegant beauty and sports style. 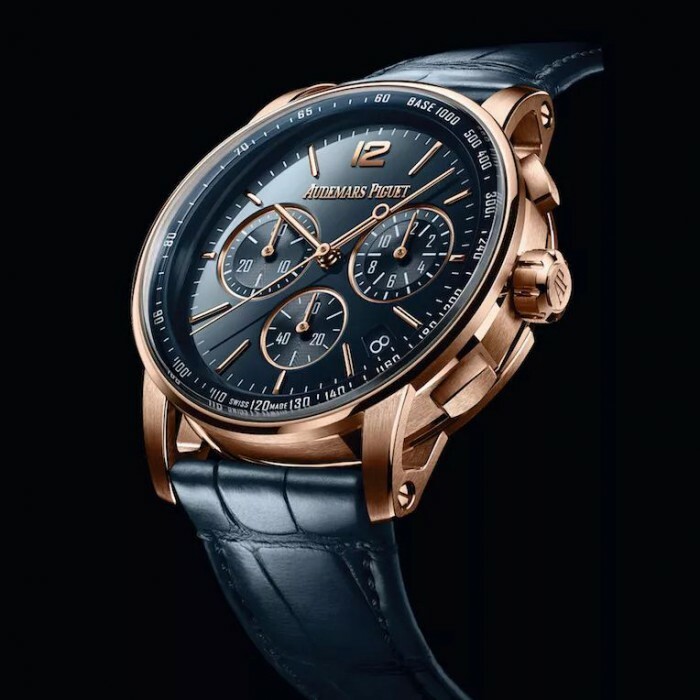 Black ceramic and 316L stainless steel PVD plated 18K rose gold perfectly combine each other, with 44 mm diameter, the rose gold case matches with highly recognizable black ceramic bezel, the black dial matches the black rubber strap, giving the first impression of the tough sports style, while rose gold material makes it equally suitable for formal wear. The black “Mega Tapisserie” oversized dial is the so-called chocolate dial. The outer black speedometer bezel is separated by an internal rose gold minute bezel, which has both a layered and recognizable function, a round date window is at 3 o’clock and a small second is at 12 o’clock. The 30-minute timer at 9 o’clock position and the 12-hour counter at 6 o’clock use different colored hands to make reading clearer. The chronograph button is rectangular and more intense than the previous round button. 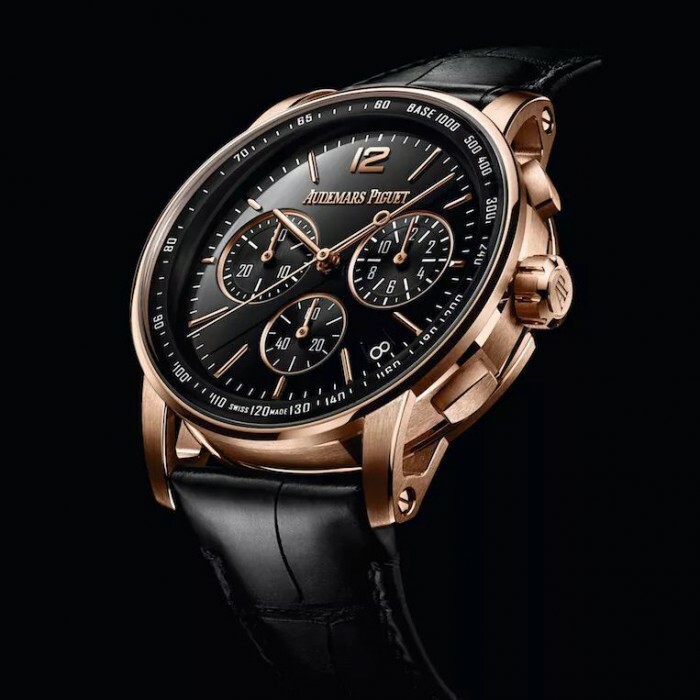 The rose gold is decorated with black ceramic for a more beautiful and dynamic look. The crown is accented with black ceramic and slightly rose gold accents. 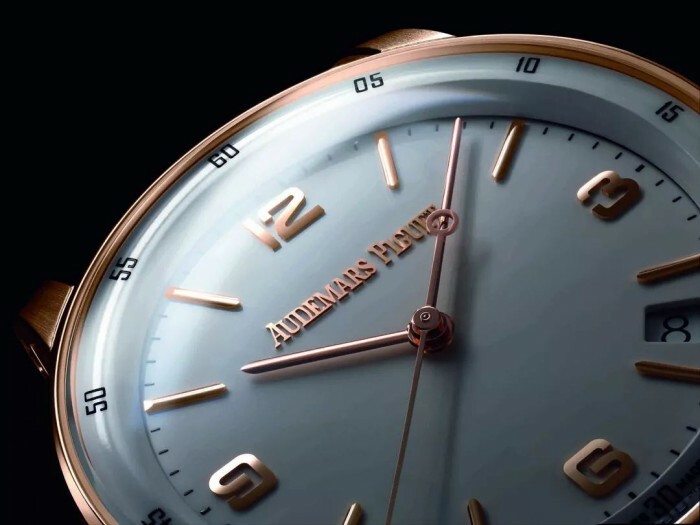 Rose gold engraved with Audemars Piguet’s classic logo – AP, and the crown with rose gold bridge aims to protect it. You can see the 14.4mm thickness more directly from the one side. Different cutting surfaces are subjected to polished or brushed, and the 3D effect is very strong. The bottom cover is the classic translucent design, with octagonal shape, each corner has a screw. The English commentary on the bottom is extremely authentic. It is engraved with an independent number. 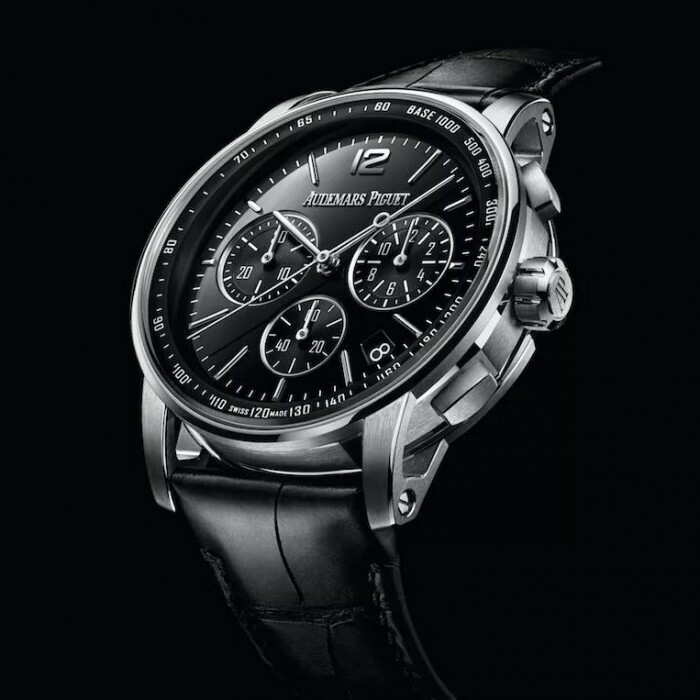 It is equipped with the Calibre 3126 self-winding movement with 45-hour power reserve, durable and everlasting. The main deck is decorated with a circular pattern, the bridge splint is hand polished and polished, and the automatic rudder is black for excellent grinding results. 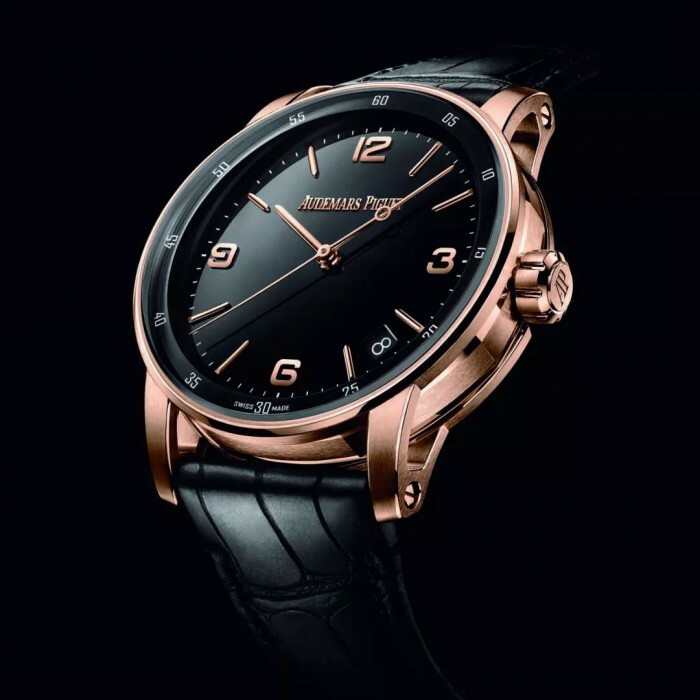 Black rubber strap with rose gold classic pin buckle brings a simple impact, the buckle is also made from 316L stainless steel PVD plated 18K rose gold, engraved with Audemars Piguet’s classic logo – AP, it is easy and comfortable to wear. The circumference of the watch is 15CM, which is slightly thick and full of mechanical feeling, and the watch with thin wrist can still be controlled. 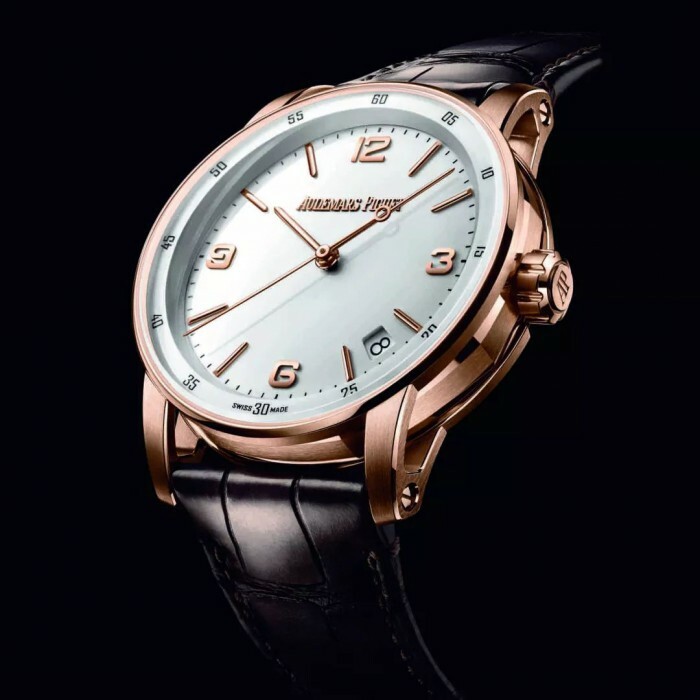 This elegant and beautiful rose gold Audemars Piguet replica chronograph watch is both of sports style and formal wearing, its workmanship details have been recognized and trusted by most Audemars fans, what’s more, the price is also attractive, which is very ideal for the men who love masculine temperament and ultimate sporting style. 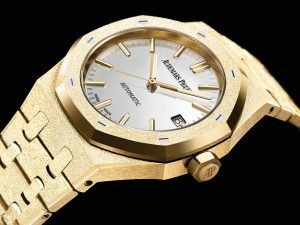 Audemars Piguet once again collaborated with Italian jewellery designer Carolina Bucci to launch the Royal Oak Frosted Gold Selfwinding Carolina Bucci Limited Edition Watch 15454BA.GG.1259BA.02. 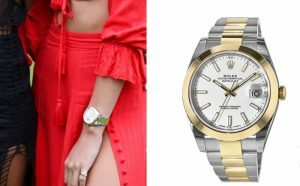 This highly recognizable watch has been described by its designers as having a “rebellious” spirit, depicting the modern woman’s casual, real and self-contained image. The watch is debuted, twhich is a tribute to the modern women who fully express the person she really is. This is a reflection on modern women. The dial design of the Royal Oak 37MM Frosted Gold Carolina Bucci Watch 15454BA.GG.1259BA.02 has changed the original Tapisserie decoration of the Royal Oak series and replaced it with a dazzling silver face. Carolina Bucci designed a new mirrored case for the watch, which is inlaid with frost gold AP lettering, making the box itself a decorative piece. In 2016, Carolina Bucci designed the brand’s first frosted gold watch to celebrate the 40th anniversary of the Royal Oak Collection women’s wristwatches. This time, the new watch has a limited edition of 300 pieces, which is evident in the new design. For the first time, it creates a diamond dust effect on gold material and becomes the favorite style of Carolina Bucci. Bold innovation also brings technical challenges. The mirror dial is the most exquisite accessory, only the most exquisite craftsmanship can be mastered. 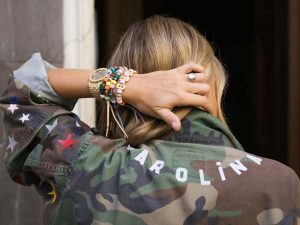 The design makes Carolina happy and satisfied while the brand’s spirit of perfection in quality control complement each other, highlighting Carolina’s unique vision and uncompromising pursuit of standards. The invention of the quartz movement in 1980 setting off a storm of mechanical clocks. 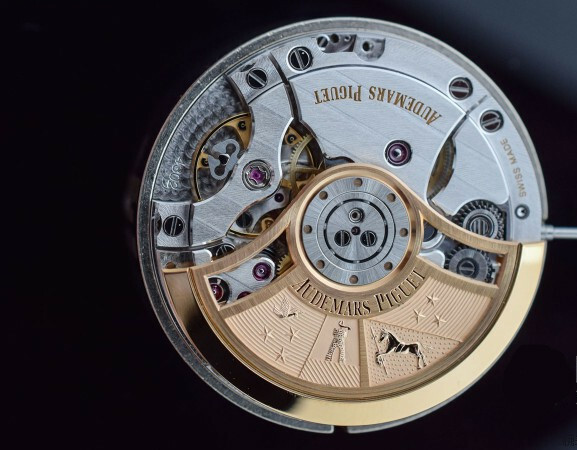 At this time, the birth of the Audemars Piguet 2120/2800 movement has an extremely important key role. In the era when mechanical clocks could be completely replaced by quartz clocks, Audemars Piguet introduced the Perpetual Calendar function in the market to prove that complex mechanical movements are promising. Introduced in 1978, the 2120/2800 is an extremely classic perpetual movement in the minds of many collectors. This self-winding Perpetual Calendar movement based on the LeCoultre movement (2120) was serviced by Audemars Piguet at the time. Michel Rochat, the master watchmaker of the year, secretly carried out research and development projects, and cooperated with Jean-Daniel Golay and Wilfred Berney to add the Perpetual Calendar module to the 2120 movement, which was the world’s thinnest self-winding Perpetual Calendar watch: only 3.95 mm in thickness. In 2015, the 5134 automatic winding perpetual calendar movement was launched. All the configurations and designs were almost the same as the 2120/2800 movements, but it only increased the diameter by 1 mm and the thickness increased to 4.31 mm. 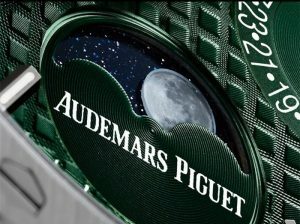 This limited edition chooses the green dial that is very rare under Audemars Piguet’s watches, and it is designed with the “Grande Tapisserie” large plaid decoration designed by Audemars Piguet for the Royal Oak series. 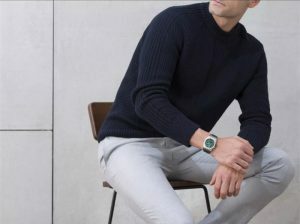 The deep green is rarely seen in the watch design. 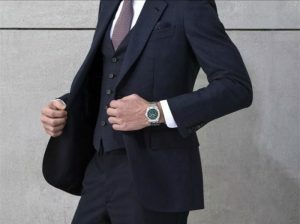 The choice of green color is derived from the brand representative color of both the Audemars Piguet and the Unique Timepiece, symbolizing the friendship between the two. In the 5134 movement, the blue moon phase is matched with the green dial, as if in the forest, looking up at the dark blue sky that is about to enter the night. Coupled with the more spacious layout of the 5134 movement, the four full calendar display circles are more fascinating. 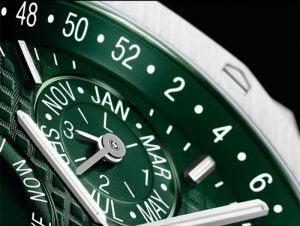 The perpetual calendar functions are displayed in a harmonious and unobtrusive position on the deep green dial. The moon phase sub-dial is decorated with radiation patterns, and the yellow center axis hands indicates the weekly calendar function of the perpetual calendar with the 5134 movement. The 5134 movement has an additional 52-week weekly calendar indicator, which is displayed on the outermost surface of the dial, which is also an extremely rare design in the perpetual calendar. 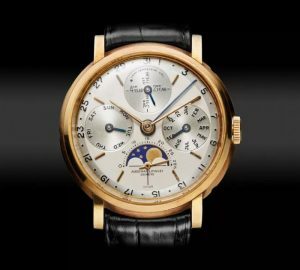 It is like the basic display function of Audemars Piguet redefined the perpetual calendar in the 1950s. The layout of the perpetual calendar 5134 calibre movement is broader and maturer than the perpetual calendar in the past. The function of the weekly calendar is also the first for the perpetual calendar. 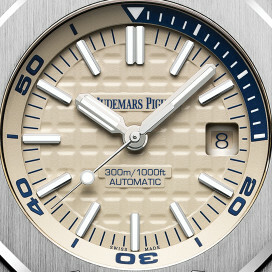 The central pointer design will increase the complexity of the overall dial. In terms of functional considerations, at the same time, aesthetics and complexity are perfectly balanced. I always think that the more complicated the display is on the dial, it is more important to pay attention to the configuration and space between each indicator pin circle, and the difference can be a thousand miles. I prefer a multi-hands design that deviates from the central axis and maintains a subtle circumferential space with the outermost edge of the dial, but is properly balanced, and the 41 mm Royal Oak Perpetual Calendar is just such a big deal. 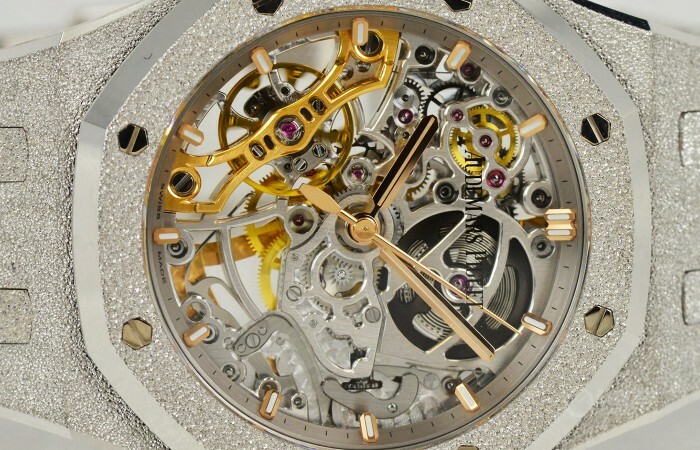 Audemars Piguet’s self-made 5134 calibre is giving this watch an extraordinary soul. 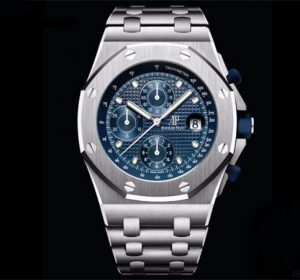 It is the limited edition of the Royal Oak Perpetual Calendar, which is launched by Audemars Piguet and the Unique Timepiece. 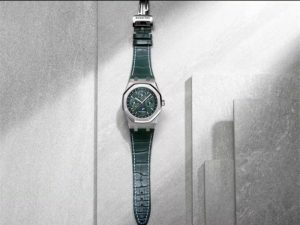 The unique green dial makes the design of the point highlight the fashion atmosphere, limited to 50 pieces. 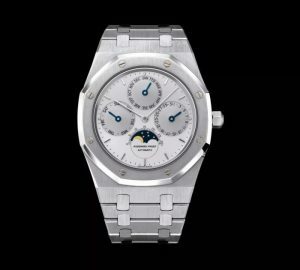 Equipped with Audemars Piguet self-made 5134 automatic winding movement with 41 mm diameter, perpetual calendar, moon phase and weekly calendar function, limited to 50 pieces worldwide. The classic status of Audemars Piguet’s Royal Oak series is without a doubt, its case is polished, and the unique shape has always been to the top of fashion trend. However, the Royal Oak series has a more classic function, I think you really need to learn it. When it comes to the distinction between the Royal Oak series and the Royal Oak Offshore series, there is a very important point. 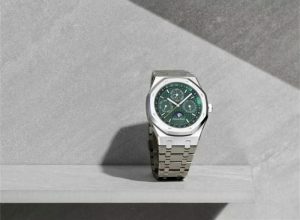 In addition to the different details of the case design, the Offshore series prefers a more sporty design, while the Royal Oak series goes a more classic performance, so the design and fluency of the case are more refined and stronger than the Offshore series, even if the Royal Oak series has added complex functions, it still has to maintain a extra-thin thickness, making the overall watch not too large and more suitable for formal wear and multiple occasions. One of the most classic features of the Royal Oak Collection is the Perpetual Calendar, which is housed in the same classic Royal Oak case and paired with the rare green dial, making it a special highlight among the Audemars Piguet Royal Oak Perpetual Calendar watches. The perpetual calendar display is the function of all mechanical movements that best describes astronomy and time. The perpetual calendar is a romantic and sensible mechanical function for me: human observe astronomical phenomena, and begin to record the changes in nature and time, further dividing the time we use into hours, minutes and seconds, and then with the month, week, date, and later we find the strange orbital irregularity of the star, and then know the method of the leap year calculation. The perpetual calendar divides the celestial movement into a complex gear after the actuarial calculation, and then displays it on the watch by hours. This reflects the relationship between human beings and nature. In the mechanical movement, a series of mathematical and mechanical engineering procedures must be used to show the time law of human planning with the interlocking relationship between gear multiples and gear shapes, then perpetual calendar, the moon phase display and etc. were born. 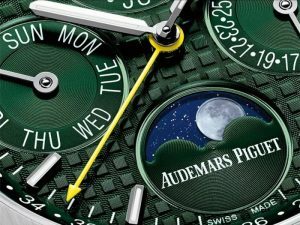 Audemars Piguet first put the leap year display into the perpetual calendar movement in 1955, the number 5516 watch is the first perpetual calendar watch to join the leap year display. 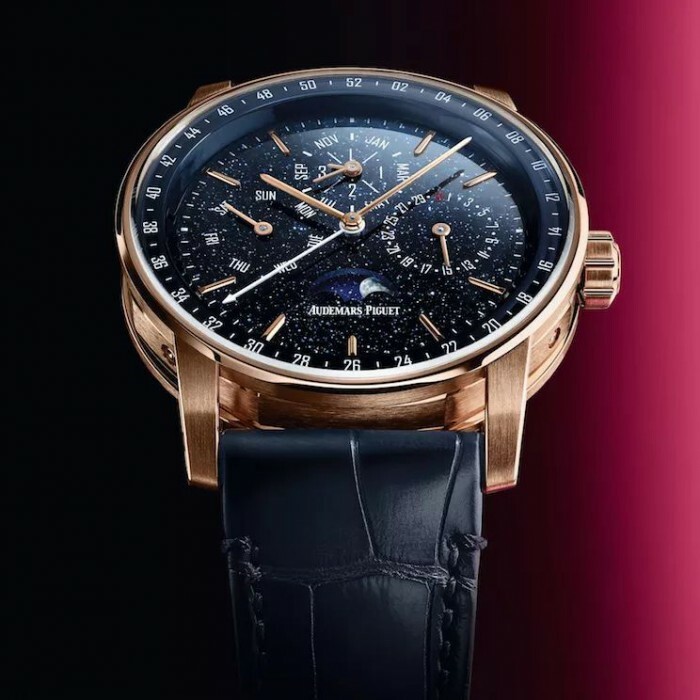 Audemars Piguet has several key points in the development of the perpetual calendar function: the display of the leap year, the addition of a convenient automatic winding device and the breakthrough of the ultra-thin perpetual calendar. The 5516 is a milestone model of the 13VZSSQP manual winding perpetual calendar movement after the full-calendar calibre of 10GHSM, 13VZAQ, 9/10RSQ, etc. The 5516 is not only the first wrist to incorporate the leap year display into the perpetual calendar function, but also almost made the leap year display an important watch for the basic calendar of the future. Audemars Piguet’s Royal Oak Offshore Watch has received a lot of attention since its birth. 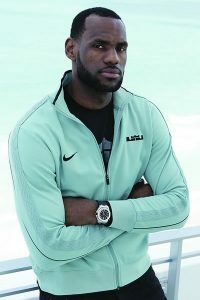 Since its inception in 1993, the Audemars Piguet Royal Oak Offshore Watch has never been interrupted in terms of styling, function and material, and now has many loyal fans from celebrities, such as LeBron James, Denzel Washington, Stan Wawrinka, Novak Djokovic, and so on. 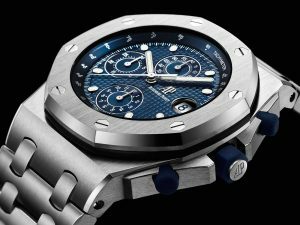 This year, Audemars Piguet celebrated the 25th anniversary of the Audemars Piguet Royal Oak Offshore Collection Chronograph Steel Selfwinding Wristwatch 26237ST.OO.1000ST.01, in particular originated from a Royal Oak Offshore Watch in 1993, launching another Royal Oak Offshore watch, while in the premise of loyal to the original design, it also incorporates new modern craftsmanship and technology. This Royal Oak Offshore (reference: 26237ST.OO.1000ST.01) reproduces the 1993 original design with a 42mm stainless steel diameter and 14.4mm thickness case with a blue rubber crown and chronograph button. The traditional blue coloured dial is embellished with a “Petite Tapisserie” small plaid trim, matching well with a steel strap and the folding clasp designed with “AP” characters. The integrated process of the bracelet, the length of the bracelet link has a total of 138 corners that need to be manually polished, so that each link achieves a fully symmetrical bevel effect, as well as a polished and matte interlaced visual aesthetic. 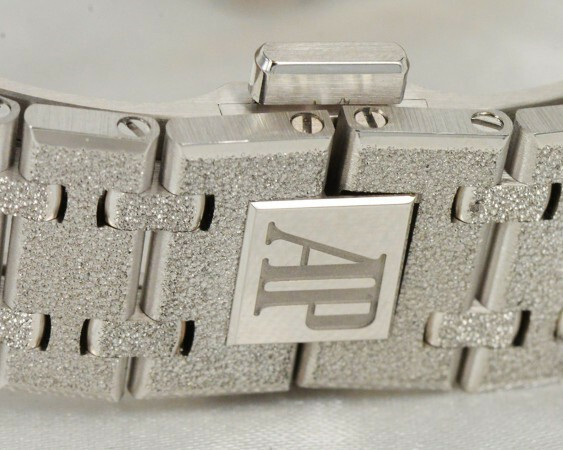 The word “AP” folding clasp is true to the original. Traditional blue dial with “Petite Tapisserie” small plaid decoration is loyal to the original Royal Oak offshore prototype, the fluorescent coated oval hour markers and hands are almost the same as the first, timing and small seconds sub-dials also use the “double circle” design in the original design, which now looks very retro, fulling of charm. The 3 o’clock is a round date display window, which is also a big change in the dial. The original date dial is black and the position is deep. Its date window is designed with a blue background. The 12-hour counter is at 6 o’clock, the 30-minute counter is at 9 o’clock, and the small seconds is at 12 o’clock. 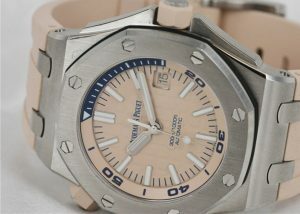 Unlike the previous models, the new piece has a “Royal Oak Offshore” logo on the center and “AUTOMATIC” on the bottom. Equipped with the Calibre 3126/3840 self-winding movement, the technically upgraded movement provides a minimum of 50 hours of power reserve. Summary: Undoubtedly, this year’s 25th anniversary of the Royal Oak offshore model will surely become the popular model of Audemars Piguet this year. 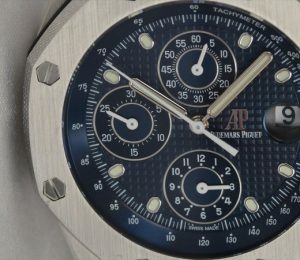 The whole is almost completely in accordance with the original design in 1993, but the innovative small details make it are more functional and comfortable to wear, that is the highest level of this Audemars Piguet Royal Oak Offshore Collection Chronograph Steel Selfwinding Wristwatch 26237ST.OO.1000ST.01. 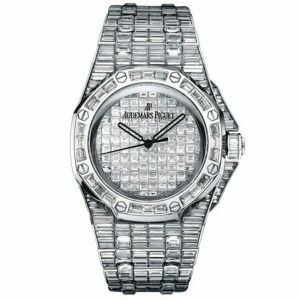 The Audemars Piguet Royal Oak series was born in 1972, its appearance subverted the design of the watch at that time and became the first luxury stainless steel watch in the history. At this year’s Geneva exhibition, Audemars Piguet launched a new art work – the Royal Oak series Double Balance Wheel Openworked watch, which continues the tradition of brand innovation and creates with a dazzling “golden” process, bringing a new visual aesthetic with a hollow design dial that allows complex internal mechanisms from both sides of the case have a panoramic view. This watch follows Audemars Piguet’s classic design and combines innovative design with a new interpretation of the wrist style. Just enjoy the fascinating interpretation of ancient craftsmanship: Audemars Piguet Royal Oak Double Balance Wheel Openworked Wristwatch 15466BC.GG.1259BC.01 together. One of the highlights of this watch is the brilliant glow of the watch. This glittering effect is based on the Florentine craft, an ancient sheet metal process that uses a diamond-tipped tool to hit the white gold, giving the surface a very subtle notch that looks like a diamond. 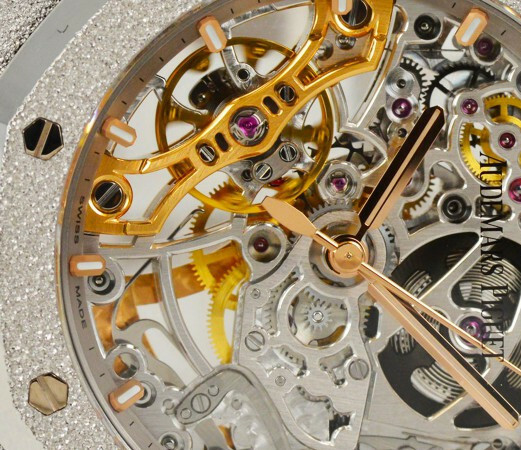 At first glance, this watch has the effect of setting broken diamonds, but in fact, Audemars Piguet has carried out experiments for several months, making the surface of the watch’s frost gold look more awkward under the light, and retaining the flexibility of the Royal Oak series watches strap. The outside of the bezel and strap are treated with a brushed and polished finish that blends perfectly with the grainy texture of the frosted gold and the fine luster of the metal for a distinctive look. The open-worked process has always been one of Audemars Piguet’s expertise. Its cuts the parts without damaging the metal parts, creating a light visual aesthetic that allows for clear and transparent changes in depth. The watch is equipped with the Calibre 3132 self-produced movement, and the hollow design allows us to see the internal machinery. Equipped with a patented double balance device, the two sets of balance wheel and balance spring are fixed on the same axis and swing at the same frequency, showing a harmonious beauty. 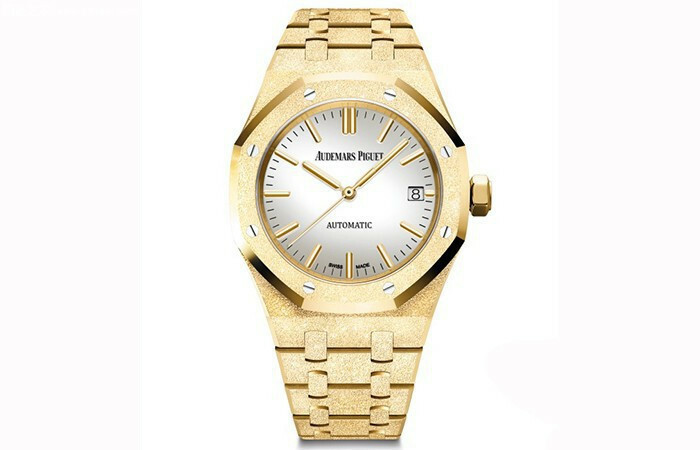 The 37 mm diameter watch follows Audemars Piguet’s classic design elements of an octagonal bezel and a hexagonal screw. The case is made of 18K white gold and the surface is treated with a sturdy frosted gold to create a diamond-like effect. The sides of the octagonal bezel are polished, and the sides of the case are brushed and polished, presenting three different viewing experiences, and resulting in multiple levels of change. The lugs and the case are integrally formed, making the overall structure simple and clean, and making the lines distinct. The dial has a openworked design with a rose gold fluorescent hour markers and a Royal Oak pointer. The hands are suspended above the dial and look very solid. The movement is chrome-plated and creates a subtle visual contrast with the hour markers and hands. All grinding and finishing of the bridge and main splint are done by hand, including angular grinding, chamfering, polishing, satin polishing and ring matte polishing. The 18K white gold bracelet is treated with frosted gold and the side is brushed and polished. It does not add or less, adding a visual effect on the basis of retaining the original flexibility. The strap is equipped with an AP folding clasp that is aesthetically pleasing and easy to wear. This watch is equipped with the same Calibre 3132 self-winding calibre as the 41mm Royal Oak series double balance openworked watch launched in 2016. It consists of 245 parts and can provide 45 hours of power reserve. 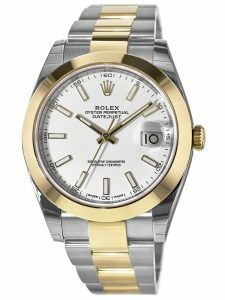 This watch uses an oscillating system with a double balance spring and double balance wheel, which greatly simplifies the structure and improves the accuracy and stability of the watch. Summary: Audemars Piguet Royal Oak series double balance wheel openworked watch retains Audemars Piguet’s classic design elements and creates a brilliant frost on it, revealing the light beauty of the movement and adding charm to the watch. In addition to this 18K white gold openworked watch, there is also a skeleton watch made of 18K rose gold. Compared to this frosted white gold watch, the openwork watch made of 18K rose gold shows fashion and personality. 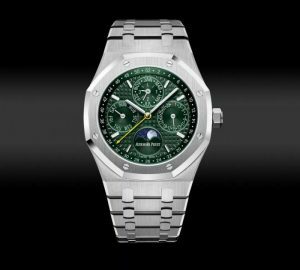 The Royal Oak Offshore Collection was born in 1993, and in that year, Audemars Piguet made a bold breakthrough and launched an Offshore watch that is larger than the Royal Oak series. 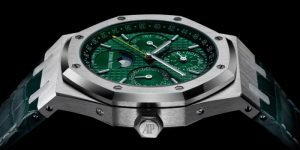 This year is the 25th anniversary of the Royal Oak Offshore Collection, for which Audemars Piguet unveiled a new Offshore collection at the Haute Horlogerie Salon in Geneva, which includes a colorful diving watch. 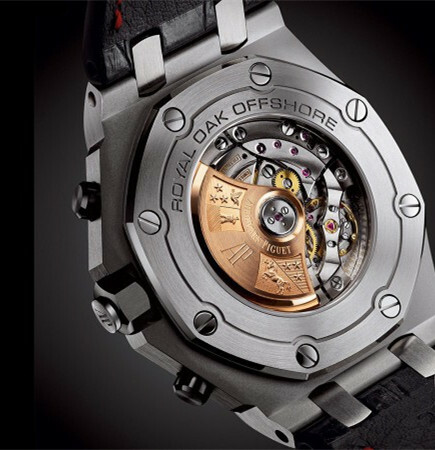 The Royal Oak Offshore Dive Watch adds a series of contemporary new features. The four colors of Lime Green, Bright Purple, Beige and Pretty Green are very bold, opening a beautiful color feast. 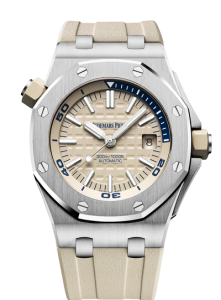 Next, let’s take a look at the Excellent Audemars Piguet Royal Oak Offshore Diver 42MM Stainless Steel Beige Mens Wristwatch 15710ST.OO.A085CA.01. The Royal Oak Offshore Dive Watch is one of the few diving watches ever adopted by amphibious and deep sea exploration professionals. 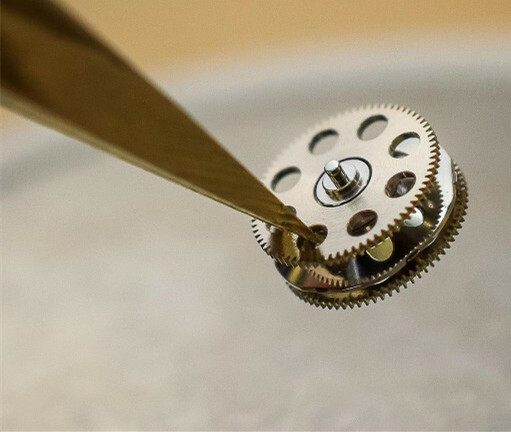 This watch uses an internal rotary timing device to effectively protect the internal rotation device. The octagonal screw-in rubber crown is located at 10 o’clock. It feels good and does not slip when operate. The watch movement is equipped with a magnetically shielded inner casing to protect the watch from collision or temperature disturbance. 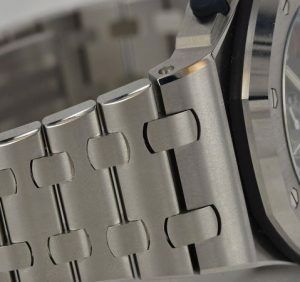 The case is secured with a bottom cover screw, a locking nut, and a pair of hexagonal screws that are unique to Audemars Piguet. 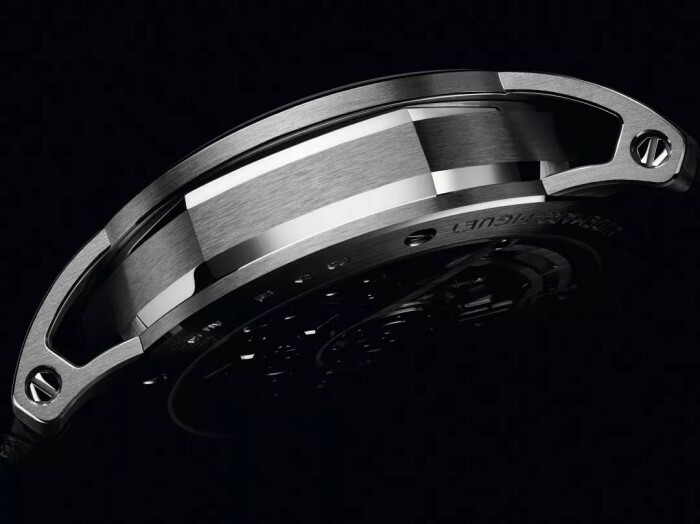 This design protects the watch from the underwater environment like a submarine hatch. The beige rotating inner bezel with blue for 0 to 15 minutes is very eye-catching, while the inner bezel’s time display scale has been specially designed to read the time at a glance even in the deep sea, adding to the safety features of the watch. These designs make this dive watch that is not afraid of adventure. The 42 mm diameter watch case is made of stainless steel with a brushed front and a beveled finish to create a two-level visual look. The watch features an octagonal screw-in bezel that complements the octagonal bezel to highlight the harmonious beauty of the watch. The watch’s dial is a low-key beige, decorated with a “Méga Tapisserie” oversized plaid, with a white gold fluorescent hour markers and a Royal Oak pointer, allowing for clear reading time even in the deep sea. A date display window at 3 o’clock adds practical functionality to the watch. The watch features a beige rotating inner bezel, and the 0-15 minute dial outer bezel is designed with a blue base. The impact of the color makes the rotating inner ring very eye-catching and adds a layered dial. 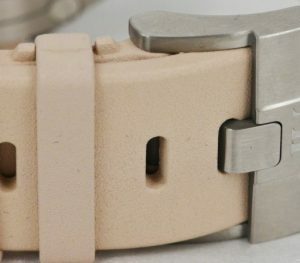 The integrated lugs are connected to the strap by two small metal links. The metal link is fixed at the lug with a bolt, the chain link and the strap are connected in series by a metal rod. The watch’s lugs are bent and fit more closely with the watch when wear. 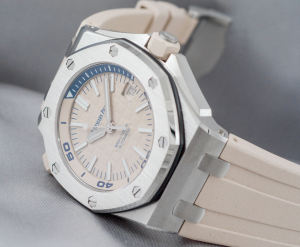 The new Royal Oak Offshore Dive Watch is paired with a beige rubber strap in the same color for a sporty look. With the steel pin buckle, it is easy to wear and safe. 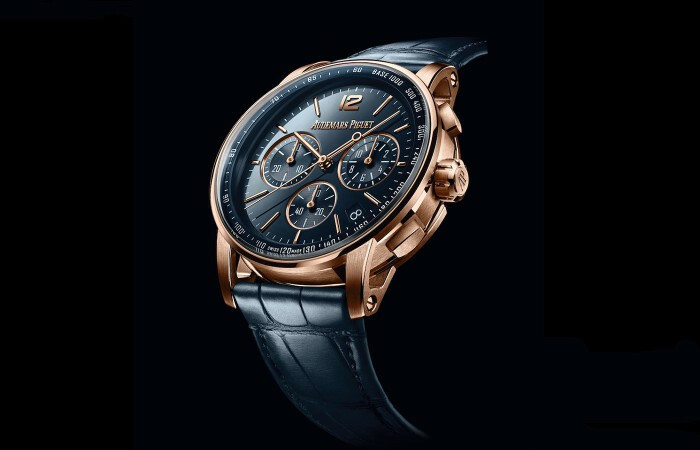 The watch is equipped with a 3210 self-winding movement, consisting of 280 parts, it provides 60-hour power reserve. The back of the case is designed with a transparent back, so you can have a clear view of the movement. The gold oscillating weight engraves Audemars Piguet’s unique and beautiful patterns as well as brand LOGO, which is very beautiful. The outstanding waterproof design makes the watch water resistant up to 300 meters. 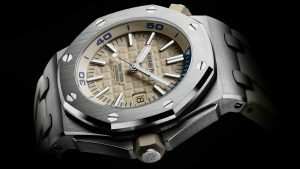 Summary: Audemars Piguet Royal Oak Offshore Dive Watch is boldly innovative in color, with a fascinating beige color, interpreting the new definition of diving watch. By virtue of calculating the rotating inner bezel and other exciting experience of diving time, it has achieved the mature temperament. Justin Bieber is in love again, yes, our boy is in love again. The story of Selena Gomez’s splitting and combining time has already made most people feel tired. But this time Bieber really fell into a sweet love, from the latest street photography, and the honey can be seen from Justin Bieber and his girlfriend eyes. Everyone must be very curious about who the heroine is, her name is Hailey Baldwin. In 2015, three years ago, she and Bieber had been together. 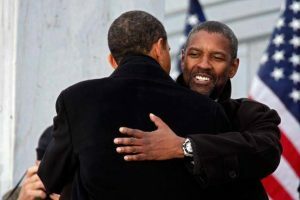 This time, “the resurgence of the old feelings” is sweeter and sweeter. They began to kiss and hold high on the streets in New York. Many people may not know who Hailey is. She is the daughter of Stephen Baldwin, a well-known American actor. Born in 1996, she is two years younger than Bieber. Now she is a model and can be seen on many international shows. For such a long time in the past, they are so sweet, that must be the true love. Especially after Bieber experienced so many ups and downs in these years, Hailey still chose to stay with Bieber, so she was just a little girl in front of love. 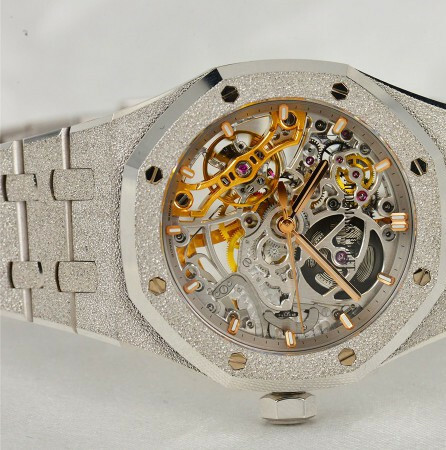 Well, after all, we are a serious website collecting professional information about Audemars Piguet watches. 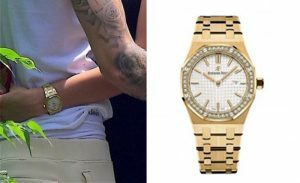 After looking at so many Hailey’s life photos, we found that this 22-year-old girl’s favorite watch is Audemars Piguet Royal Oak Top Luxury Lady Quartz Diamonds Watch 67606BC.ZZ.9179BC.01, the price is about $ 798,000.00. This watch is inlaid with 520 long-stepped enamel diamonds totaling 36.50 carats, and the case material is made of white gold, which is more noble and luxurious. In other occasions, Hailey often wears this watch. However, it’s usually matched with dress in a formal event. 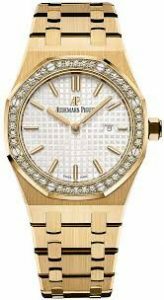 In daily life, she always chooses the Audemars Piguet Royal Oak Quartz 33mm Yellow Gold Watch 67651BA.ZZ.1261BA.01, which is lower-key than that white gold diamonds model. Others only saw their hot kiss on the street while I saw the watch on Hailey’s hand. It is also the Audemars Piguet Royal Oak series, but it is too vague. 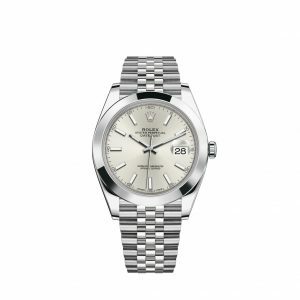 It is impossible to tell whether there is a diamond in the bezel, the dial is in white color. In addition to the Audemars Piguet Royal Oak series, I found that Hailey also has a soft spot for Rolex’s Datejust series. Rolex Datejust collection has a large number of dial diameters to choose from, but Hailey and her friend seem to have chosen a 41 mm size, this diameter seems to be just right for European and American girls who like handsome style. Love should be like this. Hope Bieber and Hailey have always been good, best blessing!